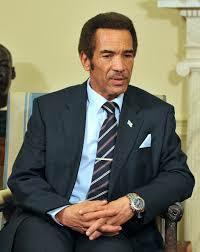 Botswana President Ian Khama believes that President Robert Mugabe of Zimbabwe needs to leave office. Asked by Reuters if Mugabe should retire, Khama responded: "Without doubt. He should have done it years ago." "They have got plenty of people there who have got good leadership qualities who could take over. It is obvious that at his age and the state Zimbabwe is in, he's not really able to provide the leadership that could get it out of its predicament," Khama said, in comments that breach an African diplomatic taboo banning criticism of fellow leaders.